The changing healthcare landscape gives pharmacists a chance to make a difference in patients' lives, a national pharmacy executive told spring graduates of Samford University's McWhorter School of Pharmacy. The ceremony was the first of six at Samford over the two-day weekend of May 16-17. Thomas E. Menighan urged the 119 graduates to "make a difference as you tell your story as a patient advocate." Menighan is executive vice president and CEO of the American Pharmacists Association. "I know it's not news to you, but you are part of something bigger than yourself," Menighan said. "You are trained to assume a major role on the health care team. Uncertainty lies ahead, but you are up to the challenge. Health care and the American public need you." Menighan said that with the implementation of the Affordable Care Act, "opportunities were dramatically expanded for [pharmacists] to play an enhanced role in team-based health care." He added that "trust in pharmacists is rock solid worldwide." "We must secure our roles on the health care team to improve medication use," he explained. "We do that by taking very complex information and simplifying it. Many patients and prescribers don't even know they need us, but they will listen." Menighan encouraged the graduates to become active volunteers and life-long learners professionally. "From my experience, whatever you invest in time, talent or treasure in our profession will pay off," he said. "Connect with practitioners and give back through mentoring others. Say informed about your profession. And, be ready to make a pitch for your profession." Menighan noted that graduates celebrate remember words heard in graduation speeches, but "we always remember how we felt as we heard. I hope you are feeling ready to help." "You will create many stories along this new path you are starting today, the stories that will help paint the picture for our case," he observed. "Stand up and share those stories. Help us make a difference." In a charge to the graduates, former associate pharmacy dean Susan Alverson said that they can control their own professional and personal destinies. Alverson is now executive director of the Alabama Board of Pharmacy. "You have made it to the end of the race. Now, what are you going to do with that prize that you have won?" Alverson asked. "The lessons you need to learn in life are just now beginning," she explained. "No one can predict your happiness. Your happiness will be the result of decisions that you make." 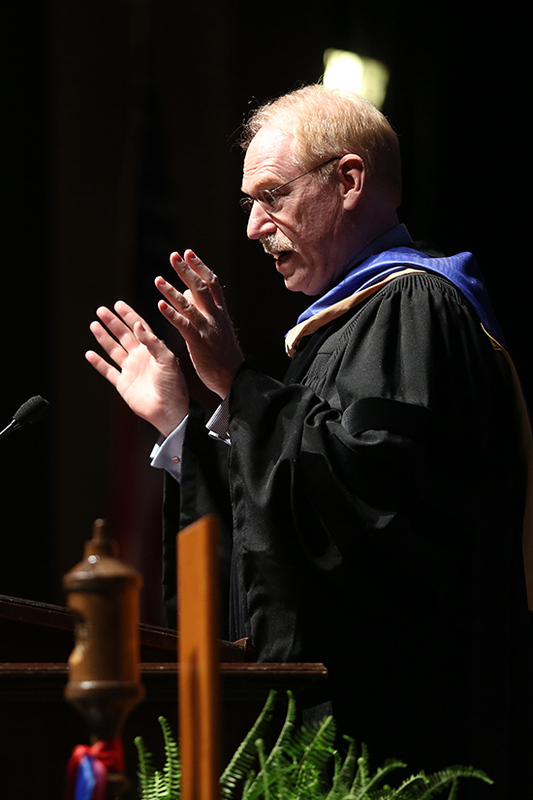 Interim pharmacy dean Michael D. Hogue led the graduates in the traditional Oath of a Pharmacist to conclude the ceremony. Earlier in the ceremony, Samford President Andrew Westmoreland recognized Hogue for his interim leadership. "I extend to Dr. Michael Hogue our sincere thanks for his careful stewardship of the McWhorter School of Pharmacy during this year of interim deanship." Westmoreland said. "He is fully deserving of our appreciation, and those of us at Samford count him as a precious colleague."